French students are heading back to the classroom this week, but a new law means that their phones won't be. Last month, the government passed a law banning the use of mobile phones, tablets and smartphones in French primary, middle and junior high schools, which teach students up to the age of 15. The ban, which covers both public and private schools, was a campaign promise made by President Emmanuel Macron. 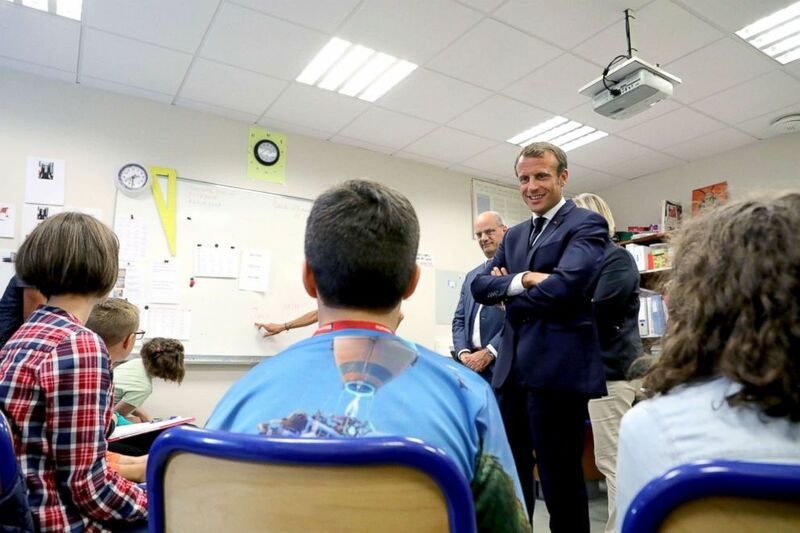 French president Emmanuel Macron, flanked by French Education Minister Jean-Michel Blanquer, speaks with the pupils of the localised educational inclusion units class at the Jules Renard secondary school in Laval, France, Sept. 3, 2018. It's now up to each school to decide how to enforce the ban. School principals can decide to store students' phones in lockers or allow them to keep them in their backpacks as long as they are switched off. Additionally, high schools can decide whether they want to implement the ban as well. There are also exceptions in cases of emergency and for disabled children, the French Education Ministry said in a statement. In emergencies, students can ask their teachers or supervisors for permission to use their phones, and schools can determine where it's best for them to do so, the ministry said. Pierre-Luc Masson is the principal at Camille Sée, an international middle and high school in Paris. He said he decided to allow his students to keep their phones with them rather than collecting them on a daily basis. "But their phones will have to stay off all the time," Masson told ABC News, adding that the new law allows teachers and school personnel to confiscate devices until the end of the day if students are caught using them. Masson said he has seen an increase in the use of smartphones at his school in recent years, and he's far from alone. Around 90 percent of French teenagers between 12 and 17 had a mobile phone in 2016, compared to 72 percent in 2005, according to a study published in 2016 by ARCEP, the French agency in charge of regulating telecommunications. Before the phone ban was passed, Masson decided to ban mobile phones in the cafeteria of his school. "Seeing children eating together but looking at their screens all the time rather than each other was unbearable," he explained. Masson said he sees the new law as "needed support from the French government" for educators trying to limit screen time. "The fact that the entire country is making an effort on this issue makes it easier to accept for everyone," Masson said. 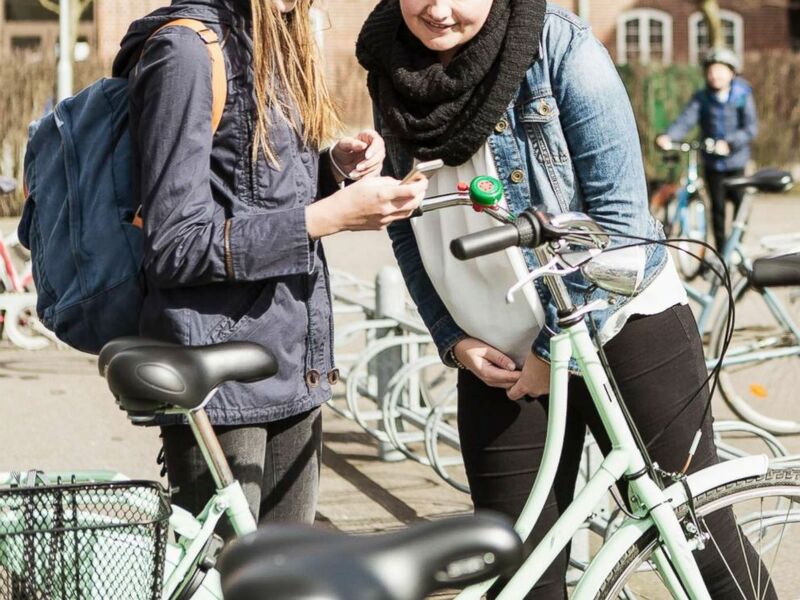 Students look at a smartphone in a courtyard in an undated stock photo. Jacqueline Kay-Cessou, an American mom who has been living in Paris for 25 years, said she was delighted when she learned of the ban. Her son David, 14, is entering 8th grade at the Camille Sée international school. "It's fantastic news. It's something I've wanted for years," Kay-Cessou told ABC News. "I think phones are harmful socially. Kids can't think and sit still anymore and it's highly addictive." Her son, David, said he hopes that with the new law, phones won't be the center of attention and it will be easier to interact with other people. "At first, mobile phones were supposed to be used to call our parents, to say when we were coming home or ask to stay at a friend's house," David told ABC News. "But to be honest, phones in schools are mostly used to play video games or watch Youtube videos. Everything is based around the phone, everybody is drawn to the screen." But critics, including Frédérique Rolet, the secretary general of the SNES, a national union for secondary school instructors, predict the law will be difficult to enforce. "There are not enough supervisors and staff in French schools to make sure the law will be respected," Rolet told ABC News. David agreed that students could find ways around the ban. "Supervisors in the courtyard during breaks are not that present," David said. "Students know the corners where school staff don't go." And even though he supports it, David didn't exactly follow the ban on his first day back. As he returned to school on Monday, David called his mother from the new phone-free courtyard between classes to tell her his new schedule. While they were speaking, he was told by a teacher to put his phone away, which he did -- and then called his mother back a minute later. "He may have been right about the difficulty of enforcing the policy," Kay-Cessou said.